Recent headlines have exposed not only disturbing inequalities in urban life across the country but what may be for some a puzzling inequality reminiscent of fifty years ago in the municipal services meant to serve all citizens. Ginger Otis Adams’ Firefight: The Century-long Battle to Integrate New York’s Bravest tells of fights against inclusion that started that have spanned a starling number of decades. Her amazing book is must reading for anyone interested in how cities work. 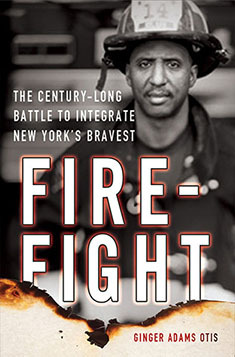 Firefight shows struggles from the formation of early urban black communities, since a group of Irish firefighters in 1903 were known to moonlight as blackface minstrels, to the aftermath of World War II when a lone black firefighter and soon-to-be congressman Adam Clayton Powell took the fight to Mayor La Guardia exposing discrimination down to the practices of keeping “black beds” and “black” dishes, to the Michael Bloomberg era when everyone avowed support for inclusion and the city was still taken to court for the now rare charge of intentional discrimination.